Pretty much everyone has felt the pain of sleep deprivation at some point in time, and understands the pain and frustration that comes with feeling sleepy all day. For some people, it might be the endless cups of coffee that seem to grow by the month and doesn’t seem to help. For other individuals, this might mean consistent headaches that don’t seem to go away regardless of the types of medications taken. Without a doubt, sleep deprivation is real and can have some devastating impacts on someones quality of life. Even worse, some people can have their sleep schedule thrown off and might find themselves falling asleep at work. 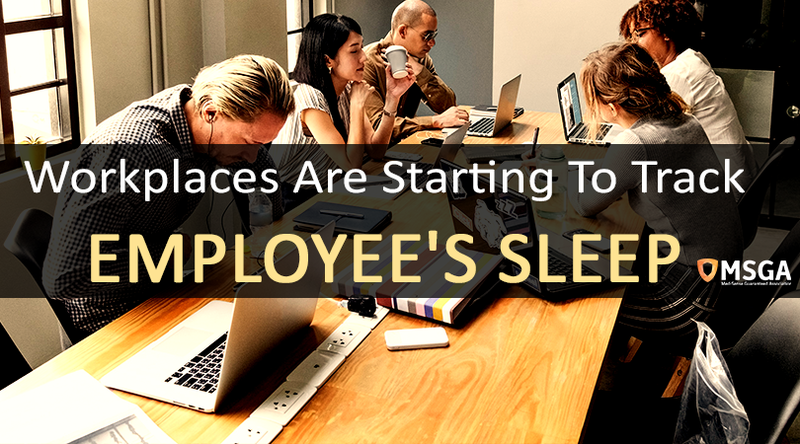 For this reason, and many others, some employers have even taken to checking in on the sleep habits of their employees. What does this mean and what are some of the impacts that sleep deprivation can have on someones overall health? Employers are Tracking the Sleep of their Employees: Why is this? Possible Lower Health Insurance Costs: If companies can demonstrate to health insurance providers that their employees are healthy, then they can bargain for lower health insurance premiums. This can improve the company’s bottom line and lead to savings which they might be able to pass on to their employees. Improve Employee Morale: If people are able to sleep better at night, this can lead to improved morale in the workplace. Those who sleep better at night are generally happier when they show up to work. This happiness can be contagious and can spread throughout the office. This leads to improved production, efficiency, and quality of work in the process. Consistent Bedtime: Most people have heard of a circadian rhythm. For those who don’t know, this is the rhythm that the body gets into when it comes to sleep and wakefulness. Sometimes, the body will not be ready for bed because the rhythm hasn’t dictated that it is time to go to sleep. To help with this, people should try to go to bed and wake up on a consistent schedule. This will help the body get into a rhythm. Bed for Sleep Only: People should also make sure that they are using their bed for sleep only. In this fashion, when they climb into bed, their body will know that it is time to go to sleep. This will help people fall asleep faster and feel more awake in the morning, ensuring that they are ready for the day. Melatonin: Melatonin has become a popular way to treat poor sleep. It has a number of impacts on the brain and has proven successful in clinical studies. While taking medications is not ideal, for those who have significant issues with sleep, this may be a possible solution. People should talk to their healthcare provider to learn more. In the end, people need to try to treat sleep deprivation from a wide variety of different directions. Using this approach, people will be able to more easily improve their work performance. They will complete assignments more quickly and with improved accuracy. Eventually, employers will notice. Clearly, sleep deprivation can be a serious issue for individuals who suffer from this on a regular basis. Because of this, employers have started tracking the sleep schedules of their employees. People should follow some of the tips listed above to try to improve their sleep routine. This could alleviate some of the symptoms that they are feeling and lead to an improvement in their quality of life. Finally, for those who suffer from intractable sleep deprivation, it is a good idea to seek help from a medical professional. There are additional solutions that might be necessary to make a true difference.